The Avantone CK-7 is a large diaphragm FET condenser microphone with multiple polar patterns. Its rugged construction and high quality aesthetic match a classy sound which makes this affordable mic brilliant value for money. 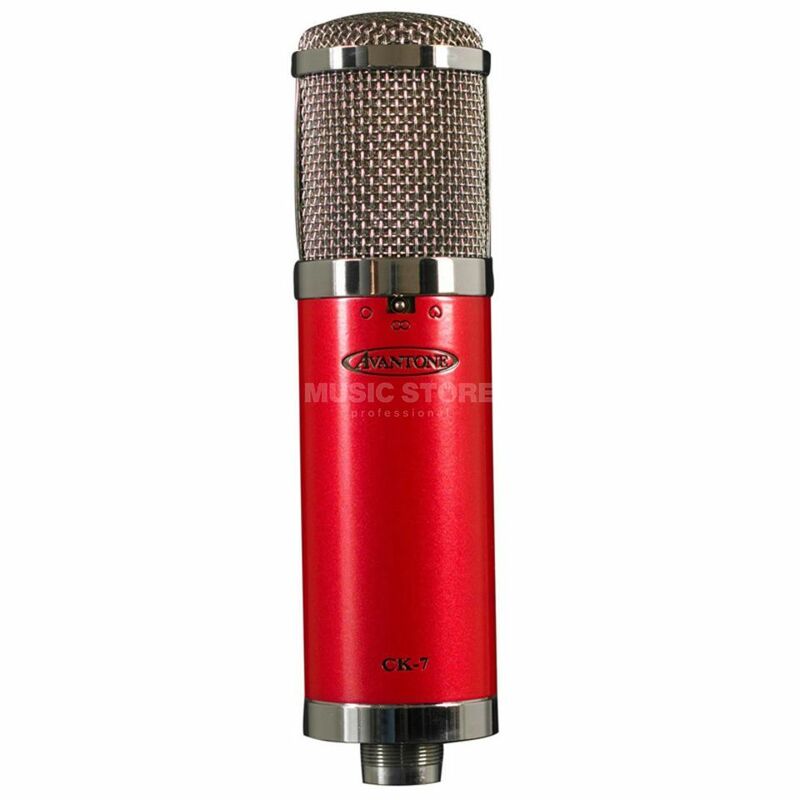 Machined from brass and finished in the bold red of Avantone's Cabernet series, the CK-7 is a larger than life vocal mic that, thanks to its selectable polar patterns, performs many studio tasks equally well. It is just at home behind a vocalist's pop shield as it is miking up a jangly electric guitar combo or recording the full-bodied tones of a cello. The Avantone microphones are known for their quality and affordability, and this is no exception - the 35mm gold-sputtered Mylar capsule and high-grade metallised polypropylene capacitors are components normally found on much more exclusive and costly microphones. Both sonically and in terms of build, this mic is a class act. The CK-7 boasts multiple polar patterns that can be switched for various applications, making it extremely versatile in any situation. To help keep your precious microphone safe, Avantone include an aluminium flightcase with the CK-7, as well as a wooden mic box. The mic is also bundled with a custom built retro-styled shock mount that keeps it stable and free from unwanted external noise. A great sounding microphone that does it all. I bought the Avantone CV7 purely based on numerous positive reviews, which can be a bit of a gamble, but I hadnt a chance to try one out for myself. So far, I have used it on acoustic guitar, vocals, a Leslie speaker and as a room mic (omni mode), and I have to say I am extremely happy with the results. Very detailed and smooth response, a decent low end and no brittle highs (on male vocal anyway). Visually the microphone looks amazing, along with the nice velvet lined wooden box and well built shock mount all packed in a handy and robust aluminum case, this is a great package. The switches on the mic are nicely accessible in case you want to change pattern, pad, or low roll-off in-situ. I think the CK7 is a great choice for anyone looking for a good quality multi purpose microphone that both sounds and looks great.